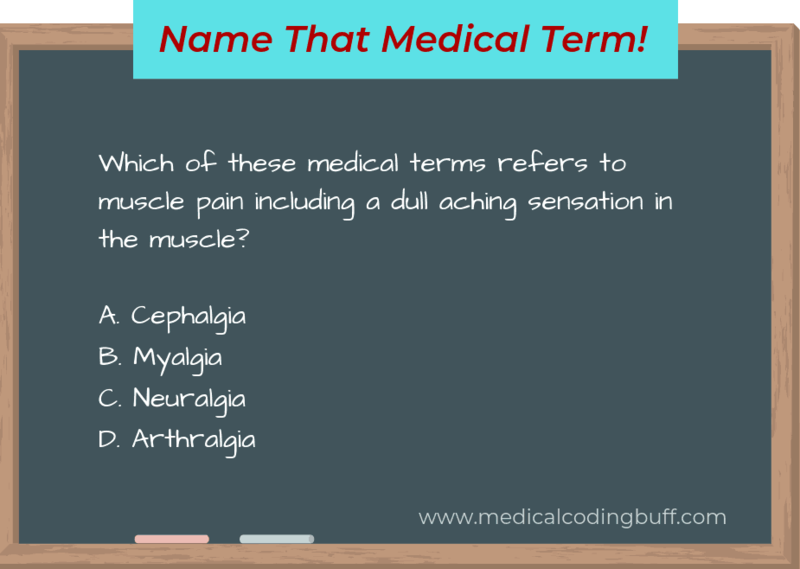 Which of these medical terms refers to muscle pain including a dull aching sensation in the muscle? Myalgia is tenderness or pain in the muscles; my/o means muscle; -algia means pain and suffering. Pain is the body’s normal reaction when something goes wrong. Most muscle pains are caused by tension, stress, overuse and minor injuries. This type of pain usually only affects a few muscles and is considered localized, according to Mayo Clinic. If pain occurs throughout the entire body, which is referred to as systemic, it is often caused by an infection, illness, or a side-effect of medication. According to Medical Terminology for Health Professions, 8th Edition, another suffix used to mean pain is -dynia (as in gastrodynia for pain in the stomach; gastr/o means stomach). The suffix -dynia is not used as often as -algia. Therefore, you will usually see gastralgia rather than gastrodynia to mean pain in the stomach. To help you, I have created a Medical Terminology Quick Reference Guide – a cheat sheet of sorts – to make it quicker and easier for you to learn these terms. The terms are broken down by common word roots, prefixes, suffixes, and combining vowels, and examples are included. The body systems and their parts are also provided. To get your free Reference Guide, complete the form below.